Michelle noticed that her face is getting fatter as days passed. Fat pads are also getting thicker at her back. She feels weak just after a few minutes of doing minimal household chores. Lately, her trunk also began having fat pads, though she is not a voracious eater. Michelle consulted a physician and she was diagnosed with Cushing’s syndrome. Cushing’s syndrome is a disorder of the endocrine system. Cushing’s syndrome (Cushing’s disease, Hypercortisolism, Adrenal Hyperfunction) is a cluster of clinical abnormalities caused by excessive levels of adrenocortical hormones (particularly cortisol) or related corticosteroids and, to a lesser extent, androgens and aldosterone. The prognosis depends on the underlying cause; it’s poor in untreated people and in those with untreatable ectopic corticotropin-producing carcinoma. Incidences of Cushing syndrome are already common worldwide. Cushing’s syndrome affects 13 of every 1 million people. It is more common in women than in men and occurs primarily between ages 25 and 40. Excess. In approximately 70% of patients, Cushing’s syndrome results from excessive production of corticotropin and consequent hyperplasia of the adrenal cortex. Tumor. In the remaining 30% of the patients, Cushing’s syndrome results from a cortisol-secreting adrenal tumor, which is usually benign. Like other endocrine disorders, Cushing’s syndrome induces changes in multiple body systems, depending on the adrenocortical hormone involved. Muscle weakness. Muscle weakness is due to hypokalemia or a loss of muscle mass from increased catabolism. Buffalo hump. Buffalo hump is one of the symptoms included in the Cushing’s triad, and these are fat pads over the upper back. Moon face. Moon face is a symptom included in the Cushing’s triad and are recognized as excess fats over the face. Peptic ulcer. Peptic ulcer results from increased gastric production and pepsin secretion, and decreased gastric mucus. Irritability. Irritability and emotional lability ranges from euphoric behavior to depression and psychosis. Hypertension. Hypertension occurs due to sodium and water retention. Compromised immune system. Increased susceptibility to infection due to decreased lymphocyte production and suppressed antibody formation. Addisonian crisis. The patient with Cushing’s syndrome whose symptoms are treated by withdrawal of corticosteroids, by adrenalectomy, or by removal of a pituitary tumor is at risk for adrenal hypofunction and addisonian crisis. Adverse effects of adrenocortical activity. The nurse assesses fluid and electrolyte status by monitoring laboratory values and daily weights. Low-dose dexamethasone suppression test. Dexamethasone (1 mg) is administered orally at 11pm, and a plasma cortisol level is obtained at 8am the next morning, and this usually confirms the diagnosis of Cushing’s syndrome. Stimulation test. In a stimulation test, administration of metyrapone, which blocks cortisol production by the adrenal glands, tests the ability of the pituitary gland and hypothalamus to detect and correct low levels of plasma cortisol by increasing corticotropin production. Imaging studies. Ultrasound, CT scan, or angiography localizes adrenal tumors and may identify pituitary tumors. Electrolyte levels. A patient with Cushing’s syndrome include an increase in serum sodium and a decrease in potassium levels. Blood studies. 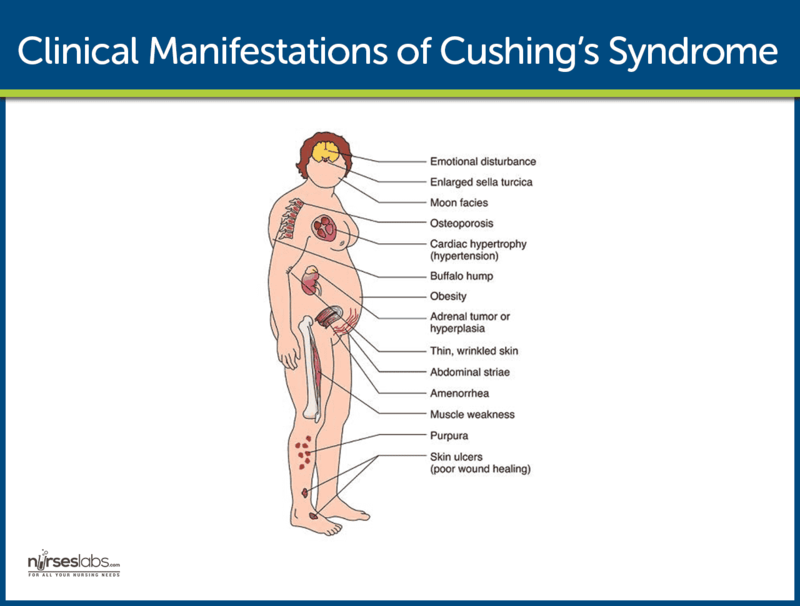 Indicators of Cushing’s syndrome include an increase in the blood glucose levels, a reduction in the number of eosinophils, and disappearance of lymphoid tissue. Treatment to restore hormonal balance and reverse Cushing’s syndrome may necessitate radiation, drug therapy, or surgery. Pituitary irradiation. Patients with pituitary-dependent Cushing’s syndrome with adrenal hyperplasia and severe cushingoid symptoms (such as psychosis, poorly controlled diabetes mellitus, osteoporosis, and severe pathologic fractures) may require pituitary irradiation. Following the prescribed drug therapy could necessitate recovery. Adrenal enzyme inhibitors. Metyrapone, aminoglutethimide, mitotane, and ketoconazole may be used to reduce hyperadrenalism if the syndrome is caused by ectopic ACTH secretion by a tumor that cannot be eradicated. Cortisol therapy. Cortisol therapy is essential during and after surgery, to help the patient tolerate the physiologic stress imposed by the removal of the pituitary or adrenals. Removal of the adrenal or pituitary gland offers a greater success rate for the recovery of the patient. Transsphenoidal hypophysectomy. Surgical removal of the tumor by transsphenoidal hypophysectomy is the treatment of choice if Cushing’s syndrome is caused by pituitary tumors and has an 80% success rate. Adrenalectomy. Adrenalectomy is the treatment of choice in patients with primary adrenal hypertrophy. 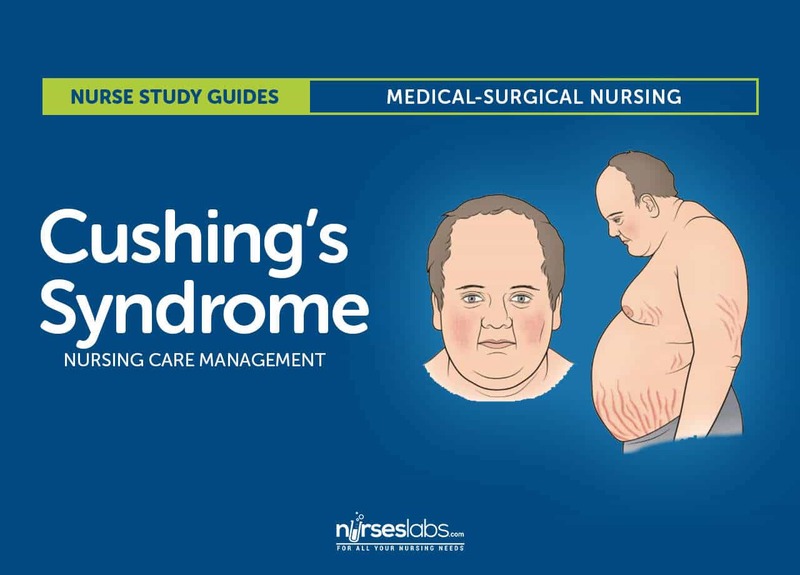 The nurse must closely monitor the patient with Cushing’s syndrome to avoid complications. Assessment focus on the effects on the body of high concentrations of adrenal cortex to respond to changes in cortisol and aldosterone levels. Health history. The history includes information about the patient’s level of activity and ability to carry out routine and self-care activities. Physical exam. The skin is observed and assessed for trauma, infection, breakdown, bruising, and edema. Mental function. The nurse assesses the patient’s mental function including mood, responses to questions, awareness of environment, and level of depression. Risk for injury related to weakness. Risk for infection related to altered protein metabolism and inflammatory response. Self-care deficit related to weakness, fatigue, muscle wasting, and altered sleep patterns. Impaired skin integrity related to edema, impaired healing, and thin and fragile skin. Disturbed body image related to altered physical appearance, impaired sexual functioning, and decreased activity level. Disturbed thought processes related to mood swings, irritability, and depression. Increase ability to carry out self-care activities. Provide a protective environment to prevent falls, fractures, and other injuries to bones and soft tissues. Assist the patient who is weak in ambulating to prevent falls or colliding into furniture. Recommend foods high in protein, calcium, and vitamin D to minimize muscle wasting and osteoporosis; refer to dietitian for assistance. Avoid unnecessary exposure to people with infections. Assess frequently for subtle signs of infections (corticosteroids mask signs of inﬂammation and infection). Encourage moderate activity to prevent complications of immobility and promote self-esteem. Plan rest periods throughout the day and promote a relaxing, quiet environment for rest and sleep. Use meticulous skin care to avoid traumatizing fragile skin. Avoid adhesive tape, which can tear and irritate the skin. Assess skin and bony prominences frequently. Encourage and assist patient to change positions frequently. Discuss the impact that changes have had on patient’s self-concept and relationships with others. Major physical changes will disappear in time if the cause of Cushing syndrome can be treated. Weight gain and edema may be modiﬁed by a low-carbohydrate, low-sodium diet; a high-protein intake can reduce some bothersome symptoms. Explain to patient and family the cause of emotional instability, and help them cope with mood swings, irritability, and depression. Encourage patient and family members to verbalize feelings and concerns. Adrenal hypofunction and addisonian crisis: Monitor for hypotension; rapid, weak pulse; rapid respiratory rate; pallor; and extreme weakness. Note factors that may have led to crisis (eg, stress, trauma, surgery). Administer IV ﬂuids and electrolytes and corticosteroids before, during, and after surgery or treatment as indicated. Assess ﬂuid and electrolyte status by monitoring laboratory values and daily weight. Acute adrenal crisis is a life-threatening condition that occurs when there is not enough cortisol, a hormone produced by the adrenal glands. Present information about Cushing syndrome verbally and in writing to patient and family. If indicated, stress to patient and family that stopping corticosteroid use abruptly and without medical supervision can result in adrenal insufﬁciency and reappearance of symptoms. Emphasize the need to keep an adequate supply of the corticosteroid to prevent running out or skipping a dose, because this could result in addisonian crisis. Stress the need for dietary modiﬁcations to ensure adequate calcium intake without increasing risk for hypertension, hyperglycemia, and weight gain. Teach patient and family to monitor blood pressure, blood glucose levels, and weight. Stress the importance of wearing a medical alert bracelet and notifying other health professionals that he or she has Cushing syndrome. Refer for home care as indicated to ensure safe environment with minimal stress and risk for falls and other side effects. Emphasize importance of regular medical follow up, and ensure patient is aware of side and toxic effects of medications. The patient and the family should be informed that adrenal insufficiency and underlying symptoms may recur if discharge orders are not complied. Medication. Instruct the patient not to stop corticosteroid abruptly and without medical supervision because the syndrome could recur, so the patient should always have an adequate supply of the corticosteroid medication to avoid running out. Diet. The nurse stresses the need for dietary modifications to ensure adequate calcium intake without increasing the risk for hypertension, hyperglycemia, and weight gain. Monitoring. The patient and family can be taught to monitor blood pressure, blood glucose levels, and weight. Follow up appointment. The nurse should emphasize the importance of regular medical follow-ups, the side effects of medications, and the need to wear medical identification with Addison’s and Cushing’s disease. Client’s/caregiver’s understanding of individual risks and safety concerns. Plan of care and who is involved in planning. Individual responses to interventions, teaching, and actions performed. The disappearance of lymphoid tissue. A reduction in circulating eosinophils. D: Cushing's syndrome is associated with the disappearance of lymphoid tissue, reduction in circulating eosinophils, and an elevated cortisol level. A, B, C: These laboratory values are present in a patient with Cushing's syndrome. D: Weight gain and edema may be modified by a low-carbohydrate, low sodium diet, and a high protein intake may reduce some of the other bothersome symptoms. A, B, C: Incorporating the following in the diet could help modify the clinical manifestations of Cushing's syndrome. C: Dexamethasone (1mg) is administered orally at 11pm, and a plasma cortisol level is obtained at 8am the next morning, and this usually confirms the diagnosis of Cushing's syndrome. A: Transsphenoidal hypophysectomy is the surgical removal of the pituitary tumor. B: Adrenalectomy is the treatment of choice in patients with primary adrenal hypertrophy. D: In a stimulation test, administration of metyrapone, which blocks cortisol production by the adrenal glands, tests the ability of the pituitary gland and hypothalamus to detect and correct low levels of plasma cortisol by increasing corticotropin production. Monitoring fluid intake and output. Administering foods rich in sodium. A: The patient with Cushing's syndrome retains sodium and water, so careful monitoring of the intake and output should be performed. B: Foods that are low in sodium should be given to the patient to further avoid edema. C: It is not recommended to stop corticosteroid abruptly and without medical supervision because symptoms may recur. D: Not all of the options are correct. What is included in the Cushing's triad? D: All of the options are part of the Cushing's triad A, B, C: Cushing's triad includes buffalo hump, moon face, and trunchal obesity. A. The disappearance of lymphoid tissue. B. A reduction in circulating eosinophils. C. An elevated cortisol level. C. Low-dose dexamethasone suppression test. A. Monitoring fluid intake and output. B. Administering foods rich in sodium. 5. What is included in the Cushing’s triad? 1. Answer: D. All of the above. D: Cushing’s syndrome is associated with the disappearance of lymphoid tissue, reduction in circulating eosinophils, and an elevated cortisol level. A, B, C: These laboratory values are present in a patient with Cushing’s syndrome. 2. Answer: D. All of the above. D: Weight gain and edema may be modified by a low-carbohydrate, low sodium diet, and a high protein intake may reduce some of the other bothersome symptoms. A, B, C: Incorporating the following in the diet could help modify the clinical manifestations of Cushing’s syndrome. 3. Answer: C. Low-dose dexamethasone suppression test. C: Dexamethasone (1mg) is administered orally at 11pm, and a plasma cortisol level is obtained at 8am the next morning, and this usually confirms the diagnosis of Cushing’s syndrome. A: Transsphenoidal hypophysectomy is the surgical removal of the pituitary tumor. B: Adrenalectomy is the treatment of choice in patients with primary adrenal hypertrophy. D: In a stimulation test, administration of metyrapone, which blocks cortisol production by the adrenal glands, tests the ability of the pituitary gland and hypothalamus to detect and correct low levels of plasma cortisol by increasing corticotropin production. 4. Answer: A. Monitoring fluid intake and output. A: The patient with Cushing’s syndrome retains sodium and water, so careful monitoring of the intake and output should be performed. B: Foods that are low in sodium should be given to the patient to further avoid edema. C: It is not recommended to stop corticosteroid abruptly and without medical supervision because symptoms may recur. A, B, C: Cushing’s triad includes buffalo hump, moon face, and truncal obesity.